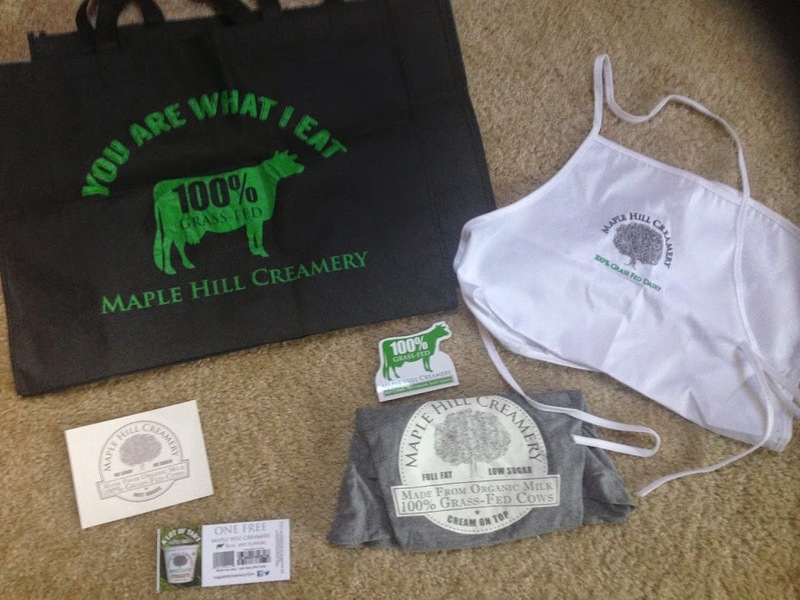 Last month I won a prize on Facebook from Maple Hill Creamery. I was thrilled because this is our favorite yogurt and we always have some in our fridge. They sent me this great prize package for winning the Facebook prize. I especially love the bag that says “you are what I eat.” The grey t-shirt fits me perfectly too. In the prize pack I also got some free coupons. 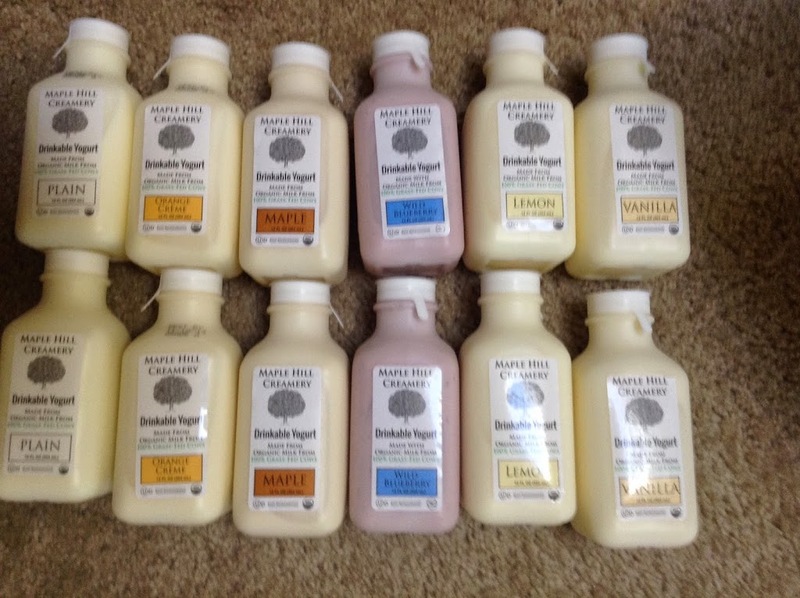 Maple Hill is one of the only Organic, 100% grass fed, full fat yogurts on the market. This is also one of the lowest sugar brands out there and one of the only brands who uses organic sugar. Natural Grocers is in the process of switching over to only carrying grass fed dairy so we were excited when they started carrying this brand. We were instantly hooked. As a general rule we only eat full-fat, grass fed dairy (and try to go raw as much as we can). If you’re interested in why full-fat is best check out this article from Mercola and I’d encourage you to do research on your own too. If you haven’t tried grass fed dairy you’re in for a treat. The flavor is a lot different than grain fed dairy and I notice a big difference in texture too. Milk from a cattle that has been fed grass is higher in a number of vitamins and the flavor actually varies as the grass the cattle are eating changes throughout the year. If you’re interested in learning more about the process of grass fed dairy or the benefits check out this great infographic from Maple Hill. The drinkable yogurt was a product we hadn’t tried yet so as soon as I finished taking this picture we busted right into one 🙂 My son (he’s almost 4 years old- can you believe it?!?!) is obsessed with all things blueberry so we tried it first. I wasn’t sure what to expect. I’ve had keifer but never drinkable yogurt. This is very similar to keifer but a bit thicker. I really enjoyed how smooth it was. Hubby: He was surprised at how thick it was but really enjoyed the flavor. Mama: The blueberry flavor really pops after the initial creamy flavor from the dairy fills your mouth. It’s got just the right balance of tart from the yogurt and sweet from the berries. Orange Créme: Bitty Boy and Mama didn’t try this one. Hubby said the orange flavor wasn’t as bold as he’d hoped it would be. He also noticed that he didn’t shake it well so he had a few “chunks” in it (we’ve noticed you do need to shake them before you drink them otherwise the cream does float up… but that cream is what makes it SO tasty!!). Bitty Boy: “It tastes like maple syrup.” He drank half the bottle and asked me approximately 1232423908435 times for another bottle. I think this was his favorite. Mama: This is super creamy and has a perfect maple flavor. We enjoyed some of this over our yogurt and it was awesome. Bitty Boy: “It’s sour!” He tried a little bit of it plain and didn’t love it. We put it into a smoothie and he devoured it! Mama: I don’t think I could drink this plain because I have too much of a sweet tooth. I tried a little bit and it’s just too tart for me. I used some in a smoothie and some in place of cream in a recipe. We like to use plain yogurt in place of sour cream and I plan to buy more of this to use in place of heavy cream. Loved it for that purpose! Hubby: This was his favorite. He loved the mild flavor. Mama: This was for sure my favorite. I love all things vanilla and this was great. It would be amazing as an ice cream but I could drink this every morning. The vanilla flavor is really nice and you can even smell the delicious vanilla when you open the bottle. Bitty Boy: “It’s like lemonade with milk!” He really liked this one. Mama: I was not expecting to like this as I don’t usually enjoy lemon-y things but I LOVED this. It’s a close second to the vanilla. Super mild lemon flavor and it adds a really nice fresh flavor to the yogurt. It reminded me on a lemon cream pie. I want to mix it with some of the vanilla and see how it is. Overall we really enjoyed these. I will also for sure be getting these drinkable yogurts when we’re traveling or going to be super busy out-and-about. These are also much easier to take as a snack to the park or the farm. I want to try some of these in other recipes too. Our favorite product is still the 32oz quarts of yogurt. We eat yogurt every day and go through a few quarts a week. I think the plain drinkable yogurt will become our new base for smoothies though- I loved the texture it gave to them. I for sure suggest these and hope that others will enjoy them as much as we did. Note: I was not paid to write this review. I received free product to review and the opinions expressed in this post are the opinions of myself and my family. The opinions in this post may or may not reflect the opinions of the company being reviewed. Next postWelcome to Treehouse Daily!